I placed the order for the laser-cut EvAv patch for our Patreon supporters! They will ship to me on December 9th and arrive a few days later. I will make an effort to turn these around to supporters (and staff) as quickly as possible so they arrive before Christmas! Thanks to everyone who has supported us again and again over the years. It really means a lot to me that we have survived over 18 years while many other small sites have just disappeared. I can't say enough about all the current and past volunteers who have made this possible. In another two years we will hit our 20th Anniversary! I'll have to figure out something really special for that date. It looks very nice! Great job Evil! I was just showing one of our newer employees a laser cutting machine, coincidentally inside an embroidery room. Yea, embroidered. On a black fabric background with an embroidered black edge. The black edge makes it easier to have it sewn on. If you do it without the edge, then you can only do iron on or it is harder to get someone to match the colors when they sew it on. The black edge makes it easier to have it sewn on. Guys, just get your wives or mothers to do it. There is no way you're managing the above with your man fingers. I probably could, I have long spider-like digits that extend forth from melting walls to reach for any toes that have fled the safety of the blankets while you sleep. Goodnight. sweet. alrdy know what im putting this bad boy on. looks great! For Men, I recommend putting it on the crotch of your underwear. 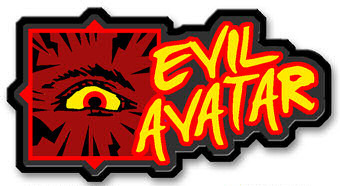 That way you can tell the ladies to check out Evil Avatar to see what's up. Win! Or get it tattooed on your unit.